Winter in the Ozarks has its ups and downs this year. A week will have highs in the 30’s, lows near 20. The next week will have 50’s for highs and 40 for a low. 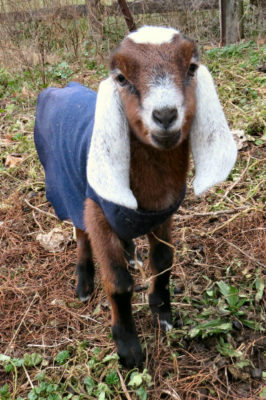 That makes winter goat kids an iffy affair. I prefer March kids. Traditionally March is more settled and warmer. The last couple have been cold, but not winter cold. Nubian bucks aren’t concerned with when kids are born, only producing them. Nubian does are the same. In the Ozarks Nubian does can cycle all year. High Reaches Silk’s Drucilla seems to be like her mother Silk and prefers winter kids. And so I have winter goat kids born December 1. The ears have it on Nubian kids. This is the bigger twin doe, independent, inquisitive, loud and demanding. It was obvious Drucilla was due soon. There was a date on the calendar for early December. Cold moved in and lingered. Kids are wet when they are born. Below freezing temperatures can freeze them quickly. Trying to tell which day kids will be born has signs that are often wrong. Suddenly winter got shoved out by fall for several days. I urged Drucilla to hurry up while the weather was kid friendly. The weather was supposed to change Friday night. I laid out towels to dry kids, wrap them and carry them to the house for time by the wood stove. Winter goat kids dry, fluffy and with goat coats on can take a lot of cold. This slightly smaller brown Nubian doe kid got pushed off the milk and needed a bottle boost. She’s doing fine now. I knew Drucilla would have her kids Saturday morning. The expected cold front got delayed. Saturday dawned bright and warm. The kids were dry and up when I got to the barn. They had the entire warm day to get thoroughly dry and fluffed up. Saturday night brought the edges of the cold front. Sunday let it settle in. Monday the twin doe kids had their goat coats on and looked like winter goat kids. 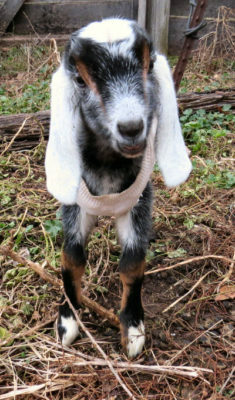 Harriet panics when her goats kid in Capri Capers. One kid is Capri. This entry was posted in High Reaches and tagged goat kids, Nubian goats, Ozark winter weather on December 5, 2018 by [email protected].